We made it home safely from the Federation of GenealogicalSocieties, 2014 Annual Meeting in San Antonio with bags full of papers and trinkets. The registration desk gave me a name tag and then offered me ribbons to attach to the name tag. My first ribbon says “I’m Connected” which was a conference theme descriptive of the connection that you make with all of the old and new friends and colleagues in the genealogy network. I was glad to see such a good showing of attendees from the greater Houston and Galveston area. 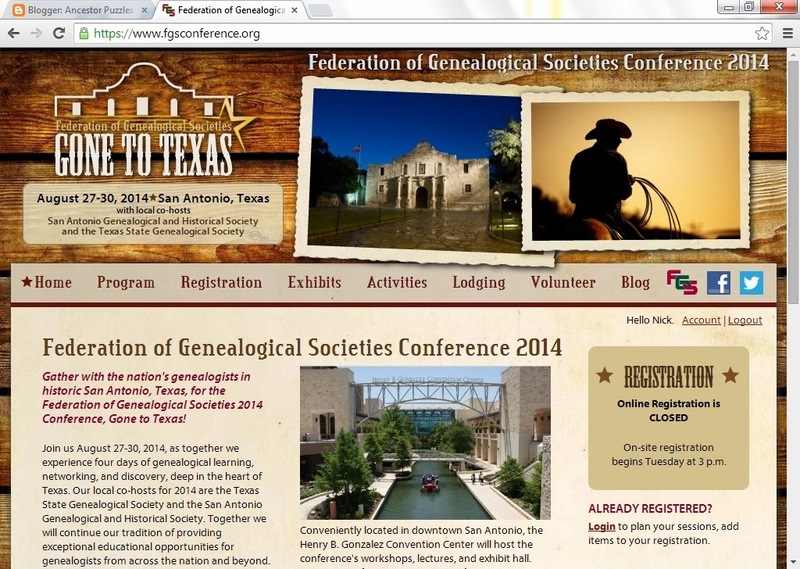 I recognized a lot of faces from the TexasState Genealogical Society. I got a chance to shake hands with the TV stars so now I really am “Connected”. The first day was focused on development and improvement of genealogical societies. I belong now and have belonged in the past to a variety of societies based on geography, ethnic origins or family names. Some are better organized than others and the Society Day on Wednesday was geared toward dragging them out of 19th century practices to better serve a 21st century world. We heard from luminaries in the genealogy world such as Curt Witcher of Allen County Public Library Genealogy Center and Josh Taylor of the PBS Genealogy Roadshow. Mr. Witcher made a comment that I found particularly memorable: a 2013 U.N. study found that there are more cell phones in the world than toilets. Of the world’s seven billion people, six billion have mobile phones. However, only 4.5 billion have access to toilets or latrines – meaning that 2.5 billion people, mostly in rural areas, do not have proper sanitation. This statistic helps to put genealogy in perspective to more urgent issues of world health. This fact also points to the omnipresence of cell phones with all of the amazing technological potential that is implied. The promise for reaching the genealogical audience through mobile technology is being pursued vigorously by Ancestry.com and FamilySearch.org. Genealogy societies need to do the same. Mr. Witcher had dozens more observations on the changing nature of our world and how genealogists should use environmental scanning to refocus our goals and objectives. The Bay Area Genealogical Society has asked me to formulate a Special Interest Group on German genealogy for presentation beginning in January 2015. The German genealogy classes at FGS were particularly useful toward that goal. I especially liked the presentations from Dr.Michael D. Lacopo. His sessions were both entertaining and action packed. His case studies demonstrated some clever techniques for uncovering the roots of German ancestors. The ever changing jurisdictions in the political history of the German speaking people make local geography especially important. Dr. Lacopo recommended that all serious German researchers should get a copy of How to Read & Understand Meyers Orts by Wendy Uncapher. The German title of Meyers Orts is: und Verkehrs-Lexikon Des Deutschen Reichs and the English translation is: Meyers Geographical and Commercial Gazetteer of the German Empire 1912. This gazetteer describes place names of the German Empire as they existed before World War I. Since many important records were kept at the local level, finding the towns of origin and residence is especially important in German research. Dr. Lacopo presented a slide based on the work of Dr. Roger Minert at BYU about the “Success Rates of American Sources in Revealing German Hometowns”. The striking fact is that Church Records are the most likely source for determining the German place of origin. You can read more about this fascinating topic here at the Family Search blog. I learned so many useful facts in four days of lectures that my brain is overflowing. Fortunately, I took good notes and I have the syllabus for future reference. Feel free to contact me with your genealogy questions. Between my resources and my “Connected” colleagues, we are sure to have an answer to even the most difficult genealogical challenges.